Be the first to share your favorite memory, photo or story of Benny. This memorial page is dedicated for family, friends and future generations to celebrate the life of their loved one. 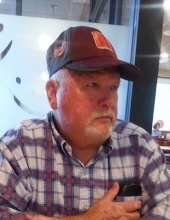 Benny Davis, age 67, of the Fork Ridge section of Raven, VA passed away at his home Sunday, November 18, 2018 following a courageous battle with cancer, surrounded by his family. He was born September 4, 1951 and was the son of the late Riley and Rosie Stillwell Davis. Benny loved camping and working on old vehicles. He enjoyed spending time with his grandchildren. In addition to his parents, he was preceded in death by one brother, Paul Davis; two sisters, Pearl Charles and Helen Wolf. Those left to cherish his memory is his loving wife, Jan Richardson Davis; one son, Joe Stilwell and wife Carri of Swords Creek, VA; one daughter, Misty Kestner and husband Caleb of Saltville, VA; three grandsons, Colton Kestner, Levi Kestner, and Cayden Kestner; one granddaughter, Peyton Stilwell; mother-in-law, Bessie Richardson of Swords Creek, VA; two sisters, Doris Horn and husband Hartford of Doran, VA, and Juanita Ketterman of Dover, DE; several nieces and nephews also survive. A special Thanks to Legacy Hospice, Dr. Hamad, Dr. Handy, and the nurses at the Lebanon Cancer Center, especially Ellen and Sutten. The family will receive friends from 6-9 p.m. Tuesday, November 20, 2018 at Singleton Funeral Service in Cedar Bluff, VA.
Funeral Services will be conducted at 1 p.m. Wednesday, November 21 at the Singleton Funeral Service Chapel with Pastor Billy Harrison and Pastor Jim Richardson officiating. Burial will follow in Greenhills Memory Gardens at Claypool Hill, VA. Pallbearers will be R.J. Davis, Josh Mabe, Jeff Davis, Jackie Dye, Tom T. Short, and Rick Vanover. Honorary Pallbearers will be the Men of the Wilderness Tabernacle and Good Friend Jack Shortt. www.SingletonFuneralService.com. Singleton Funeral Service is serving the Davis Family. To send flowers or a remembrance gift to the family of Benny D. Davis, please visit our Tribute Store. "Email Address" would like to share the life celebration of Benny D. Davis. Click on the "link" to go to share a favorite memory or leave a condolence message for the family.